The amenities and services that you'll find at the luxurious St Thomas resorts is unsurpassed. These top-notch accommodations aren't cheap, but the money you'll spend buys plenty. These top resorts are on the island's outstanding beaches. They all offer a fantastic array of comforts and amenities. And the quality of service you'll get will almost make you feel like royalty. All rates quoted are for the high-season. Remember to add 8% tax plus 10% service charge. Bolongo Bay Beach Resort is one of the smaller St Thomas Resorts, but it has all of the resort amenities along with a friendly, laid-back atmosphere. It's an easygoing, barefoot type of place. It's on a very good, 1000 foot, white-sand beach about two miles east of Charlotte Amalie. The resort offers a European plan, where guests get the use of various watersports equipment (sunfish, kayaks, windsurfers, snorkeling gear, etc.) and a free scuba lesson. There's also an all-inclusive option, in which meals and drinks are included, along with a tour on the resort's large catamaran. Rooms are comfortable and airy, with balconies and fridges and, in some cases, kitchenettes. There are also some studio and two-bedroom condo units with full kitchens. The resort offers tennis, beach volleyball, pool, and basketball courts, plus a fully equipped 5-star PADI diving operation. There are also two good restaurants on site. Rates for European plan are $300 to $330 nightly. Elysian Beach Resort is a medium-sized resort located on the east end, the area of many of the St Thomas resorts. It offers a peaceful, secluded setting on a beautiful white-sand beach on Cowpet Bay. Rooms range from lofts to studios to one- and two-bedroom suites. Some rooms have kitchens, and some are closer to the beach than others, but all have balconies with beach views. Rooms are well designed, with excellent decor and set among beautifully landscaped grounds. The resort has tennis courts, fitness center, sauna, watersports equipment, and a very nice pool. There's also two restaurants, massage, laundry service, and a shuttle to town. Rates range from $195 to $395. 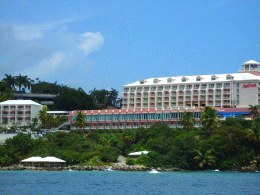 Marriott Frenchman's Reef and Morningstar are sister resorts located on the east end of St Thomas. The adjoining properties form a true American-style mega-resort. With over 500 rooms, this is the largest of all St Thomas resorts. It's set on a picturesque bluff above an excellent, half-mile-long beach (a glass elevator takes you down to the beach). Just about every amenity imaginable is on-site, including two pools, health club, spa, sauna, tennis courts, watersports center, and five restaurants, plus 24-hour rooms service. There are multiple business and conference rooms. Guest rooms at Frenchman's Reef are luxurious and very comfortable, and are even more plush at Morningstar. All rooms have private balconies with ocean views. About the only things not on the property are a golf course or scuba facility. Rates range from $239 to $369. The Ritz-Carlton St Thomas may be the most elegant of all St Thomas resorts. Designed like an Italian rennaissance villa, the resort is set on 30 lushly landscaped acres on the southeastern tip of the island. Several options in posh, elegantly appointed rooms and suites, all with private balconies. The resort overlooks the beautiful beach of Great Bay. All the facilities and amenities you'd expect are here, including two pools, health club, tennis courts, spa, sauna, watersports center, and full-service PADI dive center. There are also laundry and dry-cleaning facilities, babysitting, business services and multiple conference rooms, and four restaurants. Rates range from $489 to $1500. 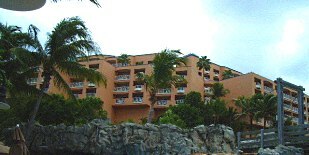 The Wyndham Sugar Bay is on the east end of St Thomas, about five minutes from the town of Red Hook. It's located in a secluded setting on a medium-sized beach at Smith Bay. Of all the St Thomas resorts, this one focuses most on all-inclusive packages, where food, drinks, and most activities are included for one price. European plan can be requested, on an as-available basis. Rooms and suites are very comfortable and well decorated, and have panoramic views of the water and the surrounding land. The resort has three pools, tennis courts, spa and health club, watersports center and scuba facility, plus three restaurants on site. There are also conference facilities, laundry and dry-cleaning, secretarial services, and children's club and babysitting. Rates are $689 to $900 (all-inclusive) and $365 to $540 (European plan).